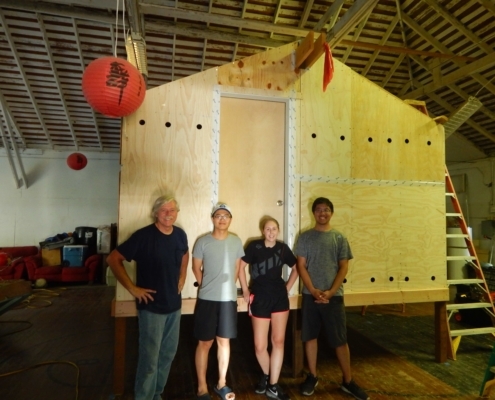 Watch a video of the downdraft rocket stove that ASAT Inc. will show in Washington D.C. at the Alliance for Green Heat/DOE sponsored Wood Stove Design Challenge from Nov 9 to 13. ASAT gratefully acknowledges support from the US Environmental Protection Agency under EPA SBIR contract number EPD18009. Long sticks are placed vertically in the combustion chamber where only the tips burn. A weight pushes the wood down as the ends turn into soft charcoal. Cooling fins on the top half of the feed tube help keep only the tips of the sticks burning. 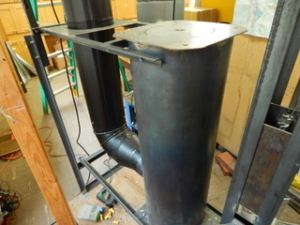 The room air is heated by the tall heat exchanger and cooking is possible on top of the cylinder. 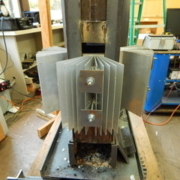 The stove features a thermoelectric generator near the coals to create 18 W of electricity when the stove is running at its 10 kW high power setting. The electricity is distributed to two USB ports for high speed cell phone charging and LED lighting. Aluminum fins protrude into the combustion chamber to bring heat to the hot side of the generator, and a radiator on the bottom of the stove draws the heat away from the cold side and into the room. It has been quite nice to have a warm lab as the temperature outside drops. You will certainly enjoy it during our post ETHOS TLUD summit.